Group Lessons are offered Memorial Day through Labor Day. Special focus on the fundamental skills of buoyancy, breath control, balance and efficient propulsion are stressed at this level, with foundational elements of the four strokes are also being introduced. Level 1: FOR AGES 4 THROUGH 7. Introduction to Water Skills: This class is for swimmers who are NOT placing their eyes in the water. 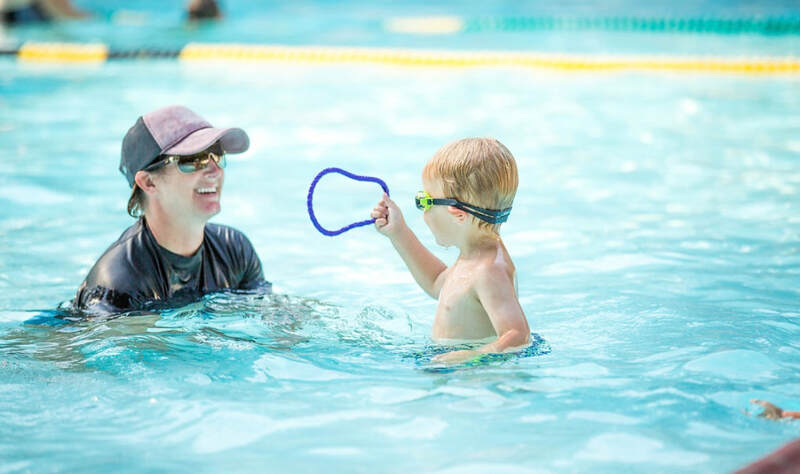 The class helps new swimmers become familiar and comfortable in the water and establishes the foundation for future proficiency and achievement. In this class, we blow bubbles, retrieve objects from the bottom of the pool, kick with and without a kickboard, learn streamline on stomach and float on our backs. We are always encouraging water safety in and around the water. **Please do NOT sign up for this class if your child is over the age of 7 years old. Contact Spindlebeak, so we may discuss a different approach. Level 2: Builds on Level-1. This class is for swimmers who are NEW to placing their eyes in the water and are ready to learn how to swim horizontally in the water. The class introduces arm stroke for the front crawl and back strokes. We continue to work on our bubbles, floating, streamlining and kicking. Level 3: Specific focus on technique emphasizing coordinating arm and leg movements and improving upon Level-2 skills. We will use the entire length of the pool to kick with kickboards. We will use half of the pool to technically improve on our front crawl and back strokes. In this class, the swimmer can already swim the front crawl on their own, however, still needs assistance with breathing to the side.